The origins of science lie in the study we call philosophy which itself is traced back through traditions of wisdom. Here a look at al Farabi's description of wisdom and the history of philosophy. This article by Professor Mubahat Turker-Kuyel, was first published in the Turkish review Erdem, 18 (1990). Ankara 1992, pp. 737-747. We are grateful to Imran Baba, editor of Erdem for allowing publication. Al-Fârâbî says that philosophy comes to us from the ancient Greeks, especially from Plato and Aristotle who have founded and perfected it. Historians of philosophy begin their studies, after citing the name of Homer, with those of the "Seven Sages" among whom Thales is cited first. All the people who are interested in philosophy know that the word philosophy is compounded from two words philia, that is quest and love and sophos that is wisdom. It seems that the word philosophy is an invention of the Pythagoreans. In the literature, the following questions have been asked rather frequently: "What is wisdom?" "What is the relation between wisdom and philosophy?" "Is this wisdom an invention of ancient Greeks or contributions from other cultures?" It seems to me that it is possible to ask these questions now with reference to Plato, Aristotle, Beressos, Ibn Newbakht, al-Fârâbî, Ibn Maymun, Roger Bacon, Miklosh Daczi Yanos, and, to the recent studies on ancient Mesopotamia. In this article, we ask all these questions and we utilize the works of al-Fârâbî, his definitions and his terms as a reference source. And we see, that according to him, wisdom has come to us from the Chaldeans; and that it is the basis of philosophy and science, as well as religion, and, that it makes the distinction between that which is intelligible with certainty, and religion which lets us know the truth by image through similitude and offers us conviction, belief and persuasion. The starting point of al-Fârâbî in these subjects is certainly found in his very important little book, entitled "The Conditions of Certain Truth." All these aspects reveal the beginning of the history of philosophy. "Wisdom is the virtue of the parts of the rational soul such as intelligence, reason, understanding, cleverness, just as courage, righteousness and altruism are the virtues of the parts of the animal soul like lust and passion. "Indeed, according to al-Fârâbî, the virtues are either "theoretical" or "deliberative" or "moral" or "practical" for all people or "nations" (Milla). We could appreciate this point also in taking into account the outlines of the philosophy of al-Fârâbî and his definitions of philosophy. It is well known that, according to the philosophical views of al-Fârâbî, existence per se is only for God Himself. This means that God exists necessarily, while His creatures exist only by God. God is the one and absolute existent per autrui whose essence is His own existence. God possesses wisdom and intellect. Thinking His essence, God, gives their existence to His creatures as well as to man. Therefore, from the First One emanates the Intellect, the Soul and the Matter. The essence of God being wisdom, and since Intellectus, Intelligens and Intellectum, all the Universe, including men, are emanated from His knowledge, all the Universe should be constructed according to divine wisdom. For this reason, the knowledge of man about God, and His creatures as they are, is human wisdom itself and the search of man for knowledge of these subjects is the theoretical virtue itself. 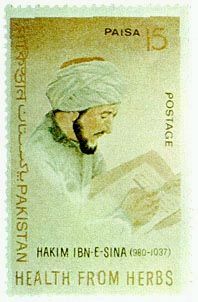 The drawing of Ibn Sînâ on the Pakistan stamp. The stamp reads: Hakim Ibn E-Sina (980-1037), Health from Herbs. The wisdom of God is identical with His life i.e. God's wisdom is "the intellection about the most venerable subject by means of the most venerable knowledge." "The most venerable subject" is God Himself. According to the philosophical view of Ibn Sînâ, man finds, the "ultimate happiness" in the search for knowledge about God. This means that man comes to imitate God's wisdom and life and that the response of man to the "Creatio Dei"(God's creatures) is only by "Imitatio Dei"(imitation of God). For example, the response of man to the "Tajallî" (manifestation) of God is only by the "Ittisâl" (contact, conjunction) of man with Him. "Imitatio Dei" is then, man's theoretical virtue itself. According to al-Fârâbî, the purpose of man in studying philosophy is to know God in order to imitate Him as much as possible. Further, "philosophy is to know the being as being. ""The end of philosophy is to know all beings as they are." Philosophy concerns all being, as in theoretical or practical philosophy. Mathematics (including Arithmetic, Geometry, Astronomy and Music), Physics and Theology are theoretical philosophy, while moral, economic and political sciences are practical ones. With all these views, al-Fârâbî establishes a parallelism between wisdom and philosophy on the one hand and a connection between wisdom and moral and political sciences on the other. He proposes wisdom as the way to the "attainment" of the ultimate happiness which is also attainment to the "certain knowledge" about God. One could attain to knowledge with certainty about God, when one studies all beings as they are or being as being. These topics are studied in the "Book of Lambda", part of the Metaphysics of Aristotle. These subjects are called sometimes "metaphysics", sometimes as "theology". Theologies come "after" physics. Its place is "higher" than it. For, to study the principles of beings and the subjects whose separation from matter is not imagery like those of Mathematics, but ontological, is the most venerable thing to do for man. All these subjects are the most venerable ones. One knows all these "most venerable subjects" by mean of the "most venerable science" which is both the "certain truth" and the "theoretical virtue". One attains to the "ultimate happiness" by integrating his "theoretical virtue" with the "deliberative" and "moral" virtues as well as with the "practical arts". With these considerations, al-Fârâbî puts together wisdom based on philosophy, and science, as well as that of religion. Then, it is clear, why in the Turkish language Physics and Biology have been called for a long time "the wisdom about nature" or "the natural wisdom" (Hikmet-i tabiiyye). For, according to al-Fârâbî, man possesses the "certain truth" as the human intellect concerns a being and the knowledge about it is exactly being the same as it is. Both this being and the knowledge about it are called "truth" or "truthfulness". When there is no doubt within the human mind about the knowledge about a being that it is exactly the same as this thing itself, this "truth" becomes "certain". Then, this state of human mind is called "certain truth". When any human intellect is not concerned about any being this being does not become "truth", it rests alone as a being. When the human intellect is concerning with the Eternal Being; with certainty, man has then, the "certain truth" the "true science", the "most venerable science". Man attains to it by asking the following questions and taking their "certain" responses which are similar to the mathematical definitions: "Whether the thing is", "What is it? ", "By which, from which, for which is it? ", "Why is it?" These questions and their responses are called the "Principles of instruction". Man attains to the First Principle by asking all the time to himself the following questions: "Whether the thing is", "Why the thing is", and having their "certain" responses. The "Principles of Being" are the following questions and their "certain" responses: "What", "By what" and "How the thing is", "For what it is." In some subjects, like the mathematical ones, the "Principles of instruction" are the same as the "Principles of being", while in some subjects it is not. There is not any "true science" about the changing objects, of course, Man attains to the "true science" through "apodeictic", that is, "certain demonstration' starting with premises which are true, general, and necessary. To attain to the "true science" or the "most venerable science" is to attain to the "certain truth". 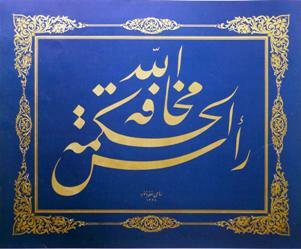 A calligraphy that mentions about wisdom (hikma): Ra's al-Hikmatu mahâfatullah. According to al-Fârâbî, this "most venerable science" that the ancient "Greeks used to call the true wisdom, is the highest wisdom. They call the acquisition of it science and the scientific state of mind philosophy, by which they meant the quest and the love for the highest wisdom. They held that, potentially, it subsumes all the virtues. They called it science of science, the mother of sciences, the wisdom of wisdoms and the art of arts. They meant the art that makes use of all the arts, the virtue that makes use of all the virtues and the wisdom that makes use of all wisdoms. Now wisdom may be used for consummate and extreme competence in any art whatsoever when it leads to performing feats of which most practitioners of that art are incapable. Here wisdom is used in a qualified sense. Thus, he who is extremely competent in art is said to be wise in that art. Similarly, a man with penetrating practical judgment and acumen may be called wise in the thing regarding which he has penetrating practical judgment. However, true wisdom is this science and state of mind alone. When the theoretical sciences are isolated and their possessors do not have the faculty for exploiting them for the benefit of others, they are defective philosophy. To be truly a perfect philosopher, one has to possess both the theoretical sciences and the faculty for exploiting them for the benefit of all others according to their capacity. Were one to consider the case of the true philosopher, he would find no difference between him and the supreme ruler." According to al-Fârâbî, man knows God and divine subjects by means of intellect.The intellect is the nearest being to God. It is a part of the "most honourable world".It is the "most honourable part of human soul. "It is a part and a faculty of the human soul by means of which man comprehends the "certain truth".When God created the beings; He gave the most convenient nature to man to receive the intellectual soul. . The first place for the human soul is in the heart which is one of the parts of the human body.The knowledge about the First One is the attainment to the ultimate happiness which is the specific perfection of man.This is the First and Eternal One who gives to the beings as well as to the man their virtues and perfection. Both ancient and new archaeological studies on the literature of wisdom and science in Ancient Mesopotamia and especially in Sumer made by many cuneiform scholars, especially by Thureau-Dangin, Neugebauer, Thomson, Arno Poebel, Landsberger, Van Dyck, and Kramer, affirm the main thesis of al-Fârâbî. As a result, we could say that, although al-Fârâbî says that philosophy comes to us from the Greeks, especially from Plato and Aristotle, both the definitions and the history of wisdom, in the light of works of al-Fârâbî as well as those of cuneiform literature, point out to us that the main conceptions of Greek philosophy and philosophers are included in the Mesopotamian, especially Sumerian literature of wisdom. Tahsîl al-Sa'âda, 49; Muhsin Mahdi, Alfârâbî's Philosophy of Plato and Aristotle, Agora, Free Press of Glencoe, New York. 1962. Kitâb al-Cam' Bayna Ra'yayn al-Hakimayn, 1, Dieterici, Leiden 1890. Lalande, Vocabulaire Technicue et Philosophique. Plato, Timaios; Aristotle (Eudemos, Matematik Tarihi); Pseudo-Hippocrates, Yedi Sayisi Uzerine 4, 2, 6; Berossos, (Conteneau, Le Deluge, 32-33, Payot, Paris 1952); Ibn Nawbakht, Kitâb Nahmutân; Ibn Nadîm, al-Fihrist, Flugel, Dodge; Al-Fârâbî Tahsîl 43; Ibn Maymun, Dalâlat al-Hâ'irîn, Fs. 54, 183, Atay, Ilâhiyât Fakultesi, Ankara 1974; Roger Bacon, Opus Maius; 0. Tertium. (Gilson, La Philosophie au Moyen Age 477-78). Huseyin Namik Orkun, Eski Turk Tazilari, III, 1940, T.D.K., 302 vd. Borger, Handbuch der Keilshriftslitteratur, De Gruyter, 1975-1977, Berlin 1979. M. Turker-Kuyel, "Sarâ'it al-Yakîn d'al-Fârâbî," Arastirma, i, 1963, 173-194, Ankara 1964. Ayrica bk. A.K.M., Fârâbî Kulliyati, no: 2. Ibn Nadîm, al-Fihrist; Ibn Abî cUsaibica, 'Uyûn al-Anbâ'; al-Kiftî, Ihbâr al-Ulama; Brockelmann, GAL, 1 Suppl, 1; F. Sezgin, Shriftstum; Ates, "Fârâbî'nin Eserleri'nin Bibliyografyasi," Belleten, 1951, XV, 57, 175-192; Pearson, Index Islamicus; N. Rescher, al-Fârâbî, Pittsburgh, 1962; M. Mahdi; La Filosofia della Natura nel Medioevo, Milano 1966, s. 772-776. Ates, no: 20, 72. Fîmâ yanbagî Kabla Ta'allum al-Falsafa. Tahsîl; al-Siyâsat al-Madaniyya; Kilâb al-Hurûf (Muhsin Mahdi); Kitâb al-Milla, (Muhsin Mahdi); Muhtasar al-Mantik; K. al-Cam‘ fî Ma'ânî'l-‘Akl. Arâ' Ahl Medîna, 5. Fasl. (Dieterici). Fusûl Muntaza'a, 62; Arâ, 62. M. Turker, L'lmportance et l'Origine de la Metaphysique chez al-Fârâbî, Die Metatphysik im Mittelalter, 1963, 418-427. De Gruyter, Berlin. Fusûl Muntaza'a, 53-54; Tahsîl, 43; Ibn Maymun, Dalâlet, Fs. 54. Dîn—Milla—Madîna, sunna—shari' a, Muhsin Mahdi, Tahsîl, VII, 86. 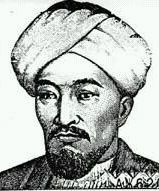 Muhtasar Mantik, Kitâb al-Burhân, 221, 228, Arastirma, 1. 1963 (1964). Muhtasar Mantik, Kitâb al-Burhân, 213-222. Muhtasar Mantik, 223; al-Kiyâs as-Sagîr. Serâ'it al-Yakîn, 195-204, 205, 212. 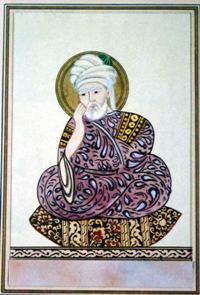 Muhtasar al-Mantik, Kitâb al-Burhân, 216-224. Ibn Abî "Usaibi'a; 'Uyûn, II, 134. Max Meyerhaf, Von Alexandrien Nach Bagdad; La Fin de l'Ecole d'Alexandrie; On the Transmission; Sayili, Fârâbi'nin...; Majid Fakhry, History of Islamic Phihsophy; 126-127, Columbia Press. New York.